PORTLAND, OR--(Marketwire - March 3, 2011) - Timbercon, Inc., a fiber optics product and solutions manufacturing company, announces today the availability of two different Fiber Optic Cable Field Repair Kits -- the Broadcast Cable Repair Kit (TK-Repair-B100) and the Harsh Environment Cable Repair Kit (TK-Repair-M100.) These kits will be officially launched and demonstrated at the upcoming OFC/NFOEC tradeshow, March 7th-10th, at booth #1547, in the Los Angeles Convention Center. "We have been requested to provide the capability to repair fiber optic cable assemblies that have been damaged while deployed for some time," stated Nolan Pitts, Key Account Manager. "These kits will allow untrained technicians to repair a SMPTE or tactical fiber optic camera cable in 20-30 minutes without access to any electrical equipment, and allow the immediate use after repair." 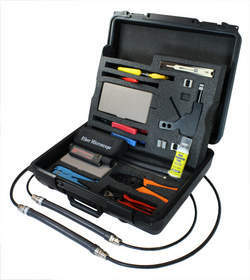 Each kit comes complete with all the necessary hand tools to prep and repair a fiber optic cable. The outer jacket is first removed, the kevlar is cut, and the inner jackets are removed. Next, the glass buffer is stripped and then a ferrule is mechanically swaged onto each end of the repaired section. These ferrules are held together in a clip mechanism that is protected by a water tight flexible tube enclosure. Replacement ferrules and flexible tube enclosures can be purchased separately for additional cable repairs. Although it is recommended that this be a temporary repair, many repaired cables have remained deployed in ultra-harsh environments for years. About this company Timbercon, Inc. The new Timbercon fiber optic cable repair kit will allow you to repair the cable in the field in approximately 20 minutes without epoxy, electricity for either an oven or fusion splicer with minimal training.